This snow that has been taunting us for the last several days and never actually appearing got me thinking about a trip I took a few years ago to Maryland and Pennsylvania, to visit the Antietam and Gettysburg Civil War Battlefields. It was February then, and it also snowed on that trip. I always thought that people in Washington State were kind of wimpy about snow – it creates an amazing amount of chaos for a few inches. I thought it would be different in Maryland, but apparently not. I flew in and went to the hotel, and watched the news reports about the Snow-mageddon of 2008. So, figuring I was either going to be stuck or not, I went to bed and slept in the next morning. In the morning, the reports were all about the snarled commute and the various repercussions of the post-apocalyptic snow event. I was in a hotel room with a sliding door looking out onto an indoor courtyard where the pool was, and no outside window. So, I slowly got prepared for what would be a horrible driving experience, and went outside – to find a quarter inch of snow on the grass and absolutely nothing on the roads or sidewalks. “Hey,” I thought, “it all melted – on with the day!” I drove out to the Antietam Battlefield, about 20 miles away, with clear roads and no issues the entire trip – only to find the Visitors Center closed due to snow. Someone had neatly taped a sign to the inside of the door telling visitors of the closure. Ok, so you mean some employee actually managed to get down to the Visitor’s Center (at significant risk of death or serious maiming – I’m kidding here if you couldn’t tell), opened the door, taped up the sign, and went home. Hello, you’re already there, why not just open? So, my trip to the Antietam Battlefield Visitor’s Center was thwarted, but I wandered around the battlefield anyway. Because, hey I was already there, and there really wasn’t much snow, as you can tell by this photo. I had a good time. During that same trip, I also headed over to Gettysburg, Pennsylvania, to see the site where the historical battle occurred. If you haven’t been there, you should go, even if you are not a Civil War history buff. There is something deeply humbling about standing on the sites where tens of thousands of Americans died for their respective causes. The town of Gettysburg is still fairly small and is unravaged by time and the development that has plagued so many other towns and cities. The buildings and fields where the battle was fought still look today like they did during that time, and in a fit of bureaucratic genius, the US government saw the need even back then to do what it could to preserve the area for the education of future generations. 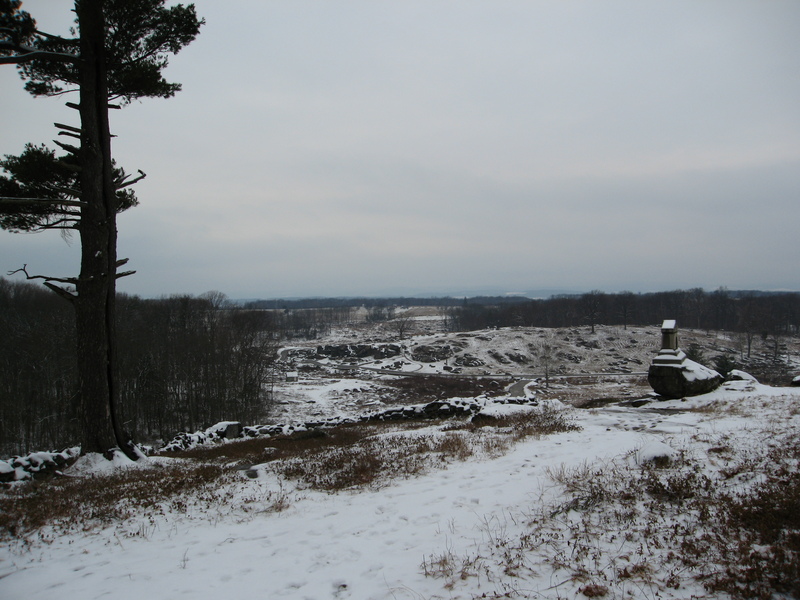 You can look out from Little Round Top and imagine the Confederate charge that Joshua Chamberlin defended against on Day 2 of the battle. You can imagine the sheer insanity of Pickett’s charge on Day 3, across more than a mile of open field, over fences and rock walls, and back up the hill into a heavily fortified waiting Union Army (I’m still amazed that anyone lived through that). And the cemetery, what could I possibly say about that? 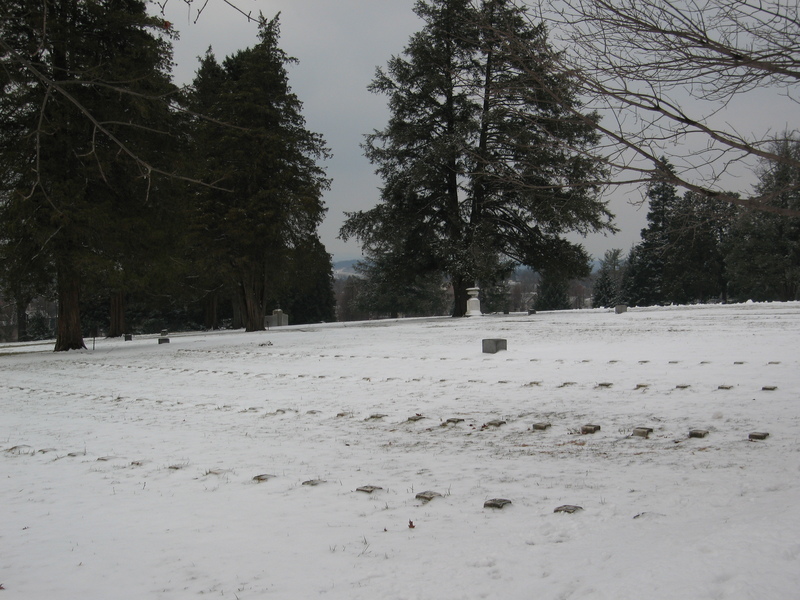 To stand on the site where Abraham Lincoln delivered the Gettysburg Address months later, and to see the countless rows of graves marked with numbers instead of names – it really makes you wonder about whether the political infighting we experience today is really worth it. 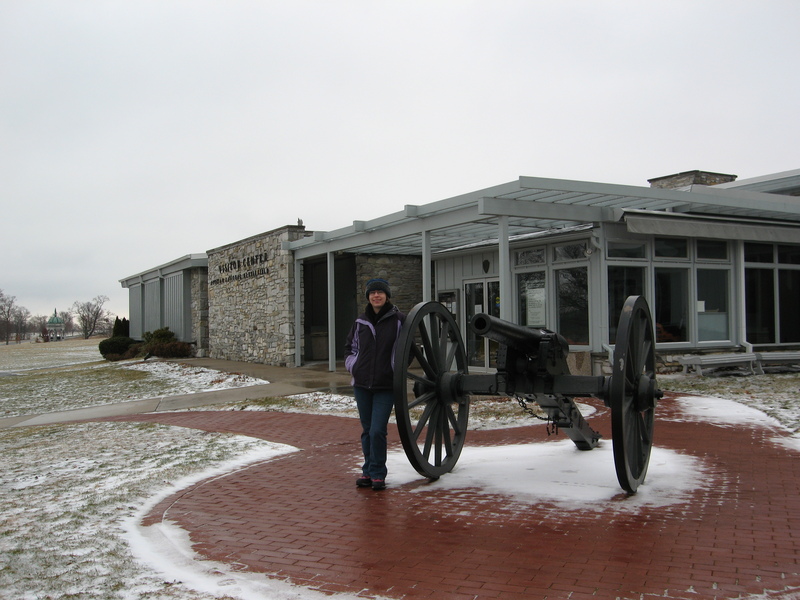 When I was there, the new Gettysburg Visitor’s Center was not yet open (it was scheduled for its opening in April, and I was there in February). The old one was open though, even though there was actually more snow in Gettysburg. They had exhibits on the weapons that were used during the Civil War, artifacts, and a lighted battlefield map that took you through the Union and Confederate positions on each day of the battle. I believe that this map was created in the 1920’s so any child today would groan at the sight of it, but I thought it was pretty cool. Apparently others did as well, because the plan was to save it, rather than trash it when the new Visitor’s Center opened. In another 150 years, history buffs and scholars will really appreciate the foresight. As usual, any good wine tour eventually comes to an end. So, unfortunately, Monday morning, we got up, and got ready to check out from our home away from home. Jon is outstanding in this capacity, because he will pack up the car with all of our wine and assorted junk while I am showering and doing my hair, as long as I am willing to make room in my suitcase for the things he can no longer fit in his. Don’t ask me why Jon who can’t fit his stuff in his suitcase – it would make much more sense if it were me who couldn’t jam everything in for the return trip. But, it is what it is, so I put his jeans, shirt and sweatshirt in mine and called it good. We headed out once again in the beautiful blue sunshine that is Eastern Washington, got on the road, and said farewell to Yakima. The Precision Fruit and Antique Stand still wasn’t open. However, we lucked out, because the Thorp Fruit and Antique Stand was open! I’ve been driving by this place on my way back and forth to Eastern Washington for years, and have never been there. So, finally, I can say I have! Of course, keep in mind that they didn’t have much in the way of seasonal fruit, given that it is February, but they do have all sorts of neat local jams, marinades, and sauces. And wine. We saw several that were local, including a few that we hadn’t had a chance to get to. They even had the Piety Flats Black Muscat, which was sold out at the winery, and I had read good reviews about (of course I got a bottle). Jon tried out the Hyatt Winery red blend (he opened it when we got home, and declared it one of his favorites from the weekend). The upstairs is really where it’s at though, for me anyway. Two floors of antique mall booths – I was in heaven. Jon was very patient, letting me browse all the way through, and only occasionally coming to ask how far I had gotten. And in the very first booth, just waiting for me, I spotted a trio of Howard Pierce Quail – the mama and two babies. For those of you who have never heard of Howard Pierce, which I’m sure is most of you, he was a potter in California from the 1930s until his death in the early 1990s. He and his wife made all sorts of pottery figurines, mostly animals, but also saints and angels, vases, and some other random items like lapel pins. His style is very distinctive, semi-abstract, and very earthy. They used just one ‘not so large’ kiln, and as a result, Howard Pierce was never mass produced. You don’t see Pierce items all that often, but when you do you will recognize them. 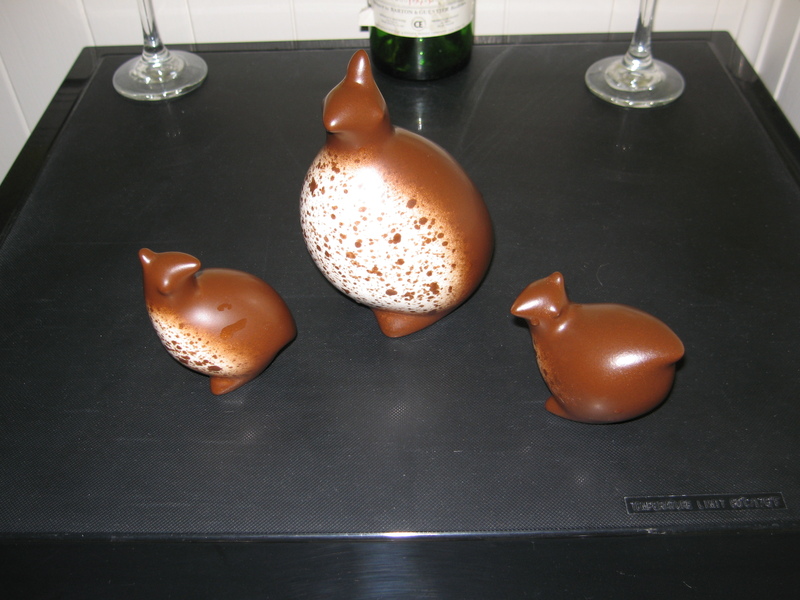 This is the little quail family that went home with me, and made the end of my weekend! In my last post, I discussed the places that we went during the first day of our Yakima Valley wine tasting weekend. We did end up heading to a few other places, quickly, near the end of the day, so I’ll do my best to sum them up too. Maison Bleue: This was the weekend’s other knockout. It was amazingly quiet, especially considering it was later in the day when we visited, and the drunken keg (or should I say wine barrel) party was in full swing at the surrounding wineries. They weren’t officially participating in Red Wine and Chocolate weekend, and they charge a $5 tasting fee, refundable upon purchase. I suppose this turned a lot of non-serious tasters off, but a nominal tasting fee is par for the course for us. We had a white blend called JaJa White that was excellent, and their La Roque Syrah was amazing (apparently these both sold out this weekend). We did get to taste a Grenache that has yet to be released, but they only had 20 bottles to sell when they started the weekend, and they were gone by the time we got there. We will be looking for these wines. Kestrel Vineyards: we know other wineries that get their grapes from the Kestrel Vineyards (I don’t know if they buy from this winery or just from the same general area), so we were kind of excited about trying some of their wines. But, unfortunately this was a disappointment. They were tasting their low end grocery store wines, and they were really trying to push last year’s vintage out the door. One of the reasons I go to a winery is to try the wines that I can’t get at home, so this was frustrating. They did do a tasting of some of their dessert wines and ports, which were nice, but Jon and I don’t typically buy them, since we aren’t big dessert people. Their low end wines were decent, but let’s just say, if I’m making a special trip to see you, I expect to get something I can’t find at Fred Meyer. Alexandria Nicole: They were serving two wines, a red and a white, but to be honest, they weren’t very memorable. Perhaps we will try again sometime when we are in Woodinville. They did have a good cheese available to taste though, which was a pleasant change from all the chocolate. It was good to get some protein, rather than just sugar. Cowan Winery: They had some good wines – the memorable wine here was their Cabernet Franc, which Jon really enjoyed. When we were done for the day, the sun was getting low in the sky, and we got to enjoy a beautiful sunset on the road back to Yakima. At that point we were tired, since we had gotten up so early, so we checked into the Ledgestone Hotel in Yakima, and schlepped our stuff from the car. When we saw our room, we were quite pleased. The Ledgestone is targeted toward the extended stay traveler, so they have a suite style room with a bedroom and living room, and a kitchen with fridge, cooktop burners, microwave, sink and dishwasher. They stock it with a few dishes and utensils so you can make a meal there. It came in really handy. Jon and I went over to the Bob’s Burgers and Brew restaurant next door to the hotel for dinner. Dinner was what you can expect from a Bob’s, the food is consistent but nothing to write home about. But it was close and has fairly quick service. Day one ended with some cable tv watching and chatting about the winery highlights. The next morning we got up and had cereal and milk (we went to the next door Target the night before and got a few staples). That was a big savings to not have to go out to a restaurant for breakfast. The second day, we decided to stick a little closer to Yakima, so we started our day wanting to scope out the Precision Fruit and Antique Stand down the road. Thwarted again… they were closed. They also had absolutely no signage indicating what times/days or which seasons they are open. That’s frustrating because the internet or tourist brochures said nothing about the stand only being open seasonally, and it would be easy enough to put a sign on the door, wouldn’t it? 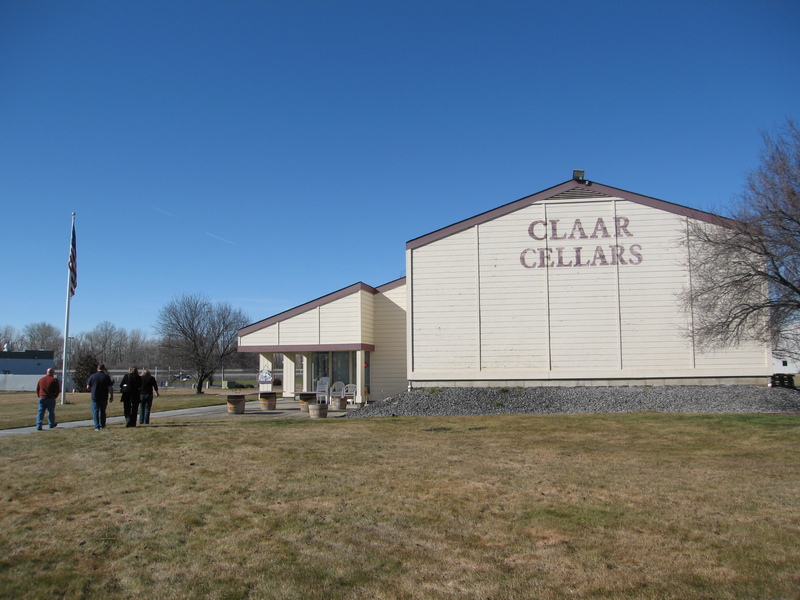 So, we decided to head the other way down the road to Zillah, and visit Claar Cellars. Claar is right off the freeway, so it was easy to find. For some reason, their tasting room reminded me of a motel, with the tasting room in the lobby/check in area. It would be interesting to know if this is true. There were not any windows on the back of the building, so if it was a motel, they walled in the windows, which would make sense for storing wine in Eastern Washington. Claar’s wines were decent, but they didn’t have anything amazing – although I did pick up a bottle of their Riesling. I guess it is telling that I found the history of the building to be more interesting than the wines. That seemed to be the theme for the weekend. At the server’s recommendation, we headed next door to the El Porton Mexican restaurant for lunch, and were happy with the lunch there. Of course, Zillah only seemed to have 3 restaurants, and one was closed, so short of driving back to Yakima, what choice did we have? Does this look like a motel to you? Next, we found Portteus Winery, one of Jon’s picks for the weekend. Portteus has a long list of wines. It runs the gamut from Chardonnay, red blends, Syrahs, Zinfandels, Merlots and Malbecs. Again, until we got up to the Reserve wines, the selection was ok, but not amazing. We both really liked their Purple Haze blend though. The winery dog is a big, black furry guy, who is very friendly and likes to roll over for belly rubs. 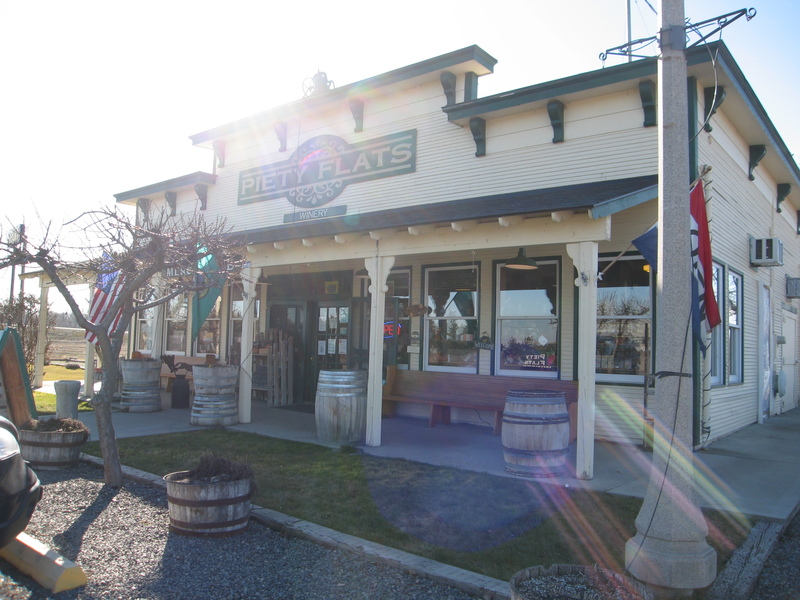 After heading back down Portteus’ long gravel road, we decided to try Piety Flats Winery. This winery is located in a turn of the century general store, and they have old photographs showing what the store originally looked like. The couple that owns Piety Flats is very friendly, and we chatted with them for awhile, since we were the only people there. They have some good wines. An unoaked Chardonnay, a Chenin Blanc (which was good, but I wish it were a bit more crisp) and a Chardonnay Pinot Gris blend. They had some good reds too, the best for me was a Carmenere which I had to get. Carmenere is a varietal done mostly in Argentina, and you just don’t find that many of them in the States. By now we were feeling a bit wined out, so we decided to check out the downtown area. Sadly, it was a bit depressing. We were there on a Sunday, and I understand you won’t have the business crowd there on the weekends, but the downtown was mostly dead. At least half of the storefronts were empty, and the only ones that seemed to have any business were the wine tasting rooms. We went to find an Antique Mall that was tucked away in an old warehouse building, and we were not sure what we were going to find. There were no cars in front, and Jon was convinced we weren’t in the right spot. The restaurant downtown that looked interesting to me online was only open Monday through Thursday. So, instead of eating out, we went to Safeway and got ingredients to make a really good salad (for Jon) and a really good fruit salad (for me). Good thing it doesn’t take much to satisfy us. 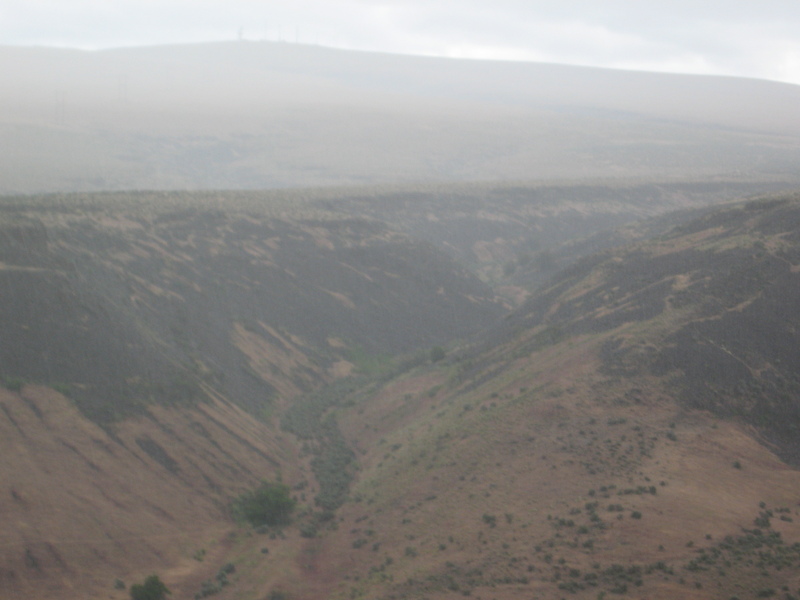 So, Jon and I headed over to the Yakima Valley for a little getaway on the long weekend. I hadn’t been to Yakima since I showed horses there in the 90’s, and even then, my experience was mostly limited to the Fairgrounds, and maybe a random McDonald’s. So, we got up early (we left the house at 6:30 am! ), and headed over to get our “wine-taste” on. We had plenty of time, and Jon wanted to start out with McKinley Springs Winery. McKinley Springs is the furthest one away, so we thought we would start there and then start making out way back to civilization. The guidebook said that McKinley Springs opened at 10 am. So, we took a tour…. out to the middle of nowhere – 30 minutes out of our way… on back roads… with nobody else on them… only to get there… and find out that McKinley Springs was not open…. Frustrating! It looked very nice from the outside, but fat lot of good that did us. I think it will be a long time before we head back out to McKinley Springs. So, next up, we had to get back to civilization. Thank god for GPS. She always knows the best route. However, in this case, since we were so far out in the middle of nowhere, the best route included six long miles on a gravel road, over a mountain, with hairpin switchbacks and no lane markings. I was a bit nervous, let’s just say. Jon kept telling me to stay in the middle of the road, but when you can’t see if there is another car coming, I was concerned about that. Of course, we didn’t pass another car the whole time we were on the road. So, after the GPS got us off the mountain, we made it in one piece to Airfield Estates Winery. Airfield is in a complex with about 10 other wineries, and this was Red Wine and Chocolate weekend. It was busy. Most of the wineries participate in the event, where you buy a passport at the beginning, and you get a free tasting, some do barrel tastings or reserve tastings, and most do a discount on your wine purchase. As we discovered, there are all types of people. There are the people who are more serious about tasting, and finding good wines, and then there are apparently a bunch of folks that are trying to get wasted (maybe its a Yakima thing). This is a “bring your own glass” event, and we saw glasses with logos, and glasses with bras, and several people that had a little holder that hung around their neck and holds the glass – a hands-free glass if you will. Now if that little hands-free device would just tip it up to their mouth, that would really be awesome! But I digress. Since there were so many wineries in a small area, I’ll summarize: the high points, if you will. Airfield: good, not outstanding. Their wines were good, but nothing spectacular. My favorite was their higher end red blend, called The Aviator. Jon also really liked The Spitfire, which is a Sangiovese blend. They served a delicious fudge brownie with fudge sauce too. Milbrandt: they had some good whites, a Riesling that was semi-sweet, and a Chardonnay that Jon liked. We picked up a bottle of their Pinot Gris that our server recommended, so I hope that it is good. Jon really liked their Estate Syrah too. Gamache: what to say about Gamache. Their regular line of wines wasn’t that great, but the reserves were pretty good. The Reserve Cabernet Sauvignon was excellent, and the Reserve Malbec was very good too. And the teeny, tiny winery dog, a Yorkshire Terrier was friendly and adorable. Apex Cellars: Apex’s grocery store line is Washington Hills, and it is mediocre. But we did their reserve wines, called the Apex Ascent and they were where it’s at. Jon and I both enjoyed them a lot. Martinez and Martinez: The hidden gem of the day. We hadn’t heard of this winery, but enjoyed their wines a lot. Their Cesar red blend is excellent, and they also have a very good Rose made from Cabernet Sauvignon. We will be looking for their wines at home. Coyote Canyon: I liked their white blend, and they do an Albarino (which is a Spanish varietal, and rare in the states). Unfortunately, it was sold out – but we got to barrel taste the next vintage. I hope to be able to buy the Albarino when it gets released again. We went to a lot of places, tried many wines, dumped many, enjoyed watching the Red Wine and Chocolate meat market before our eyes, and never even had to get back in the car! The strip mall approach has its advantages, but unfortunately, you do end up missing out on the ambiance. Jon and I enjoy having a picnic outside at a winery when the weather is nice, or sitting outside on the patio. I guess in February when it is cold out, it isn’t as big of an issue. Well, enough for now, I’ll continue my thoughts on Prosser in my next post. Yakima is just so close! So, at this point we are pondering which wineries will be on the list to visit during our upcoming Yakima Valley wine tour. Actually, many of the wineries that we are interested in are in Prosser, but Prosser apparently has very little in the way of accommodations. So, Yakima will be the jumping off point. From the wine books I have read, that seems to be what most people do. First up, Airfield Estates Winery. I received a bottle of their red blend as a birthday gift last fall from Jon’s Aunt and Uncle. I was quite impressed with this wine, especially given that it was their everyday wine – and it wasn’t a single varietal, not single vineyard, not estate grown, nor any of the other indicators that the winery believes that this wine is one of their standouts. I am curious to try more of their offerings, because if their everyday table wine is this good, imagine what they can really do! McKinley Springs – this one is a little further past Prosser I guess. We had a bottle of their Viognier last spring, and it was outstanding. Their Syrah was very impressive as well. If the drive isn’t too far, we will visit them and see what the rest of their wines are like. Kestrel Vineyards. We don’t really know much about this winery, but it was recommended at one point by someone. Of course, we can’t quite remember who – but I believe it was Tom and Tracey of Glacial Lake Missoula, who source their grapes from this area. They seem to focus on the reds though, which gets us away from the weekends purpose of restocking on the whites. Milbrandt Vineyards. This is a winery that Jon is interested in. They seem to do a little of everything, which can either be good, or not so good – we have had it both ways. We’ll have to try them out and see. Piety Flats Winery – this is Camille’s pick so far. They seem to have a good selection of different wines, including several whites and a Chenin Blanc, which is a white that we don’t see very often. Chenin Blanc at its best is a very light, crisp wine, so I can’t wait to see what they have got! We also want to head to the town of Toppenish to see their painted murals. The town has come together and painted more than 70 murals on downtown buildings, depicting scenes of everyday people living their lives, past and present. It looks like Yakima has a pretty neat historic area, with shops and antique stores. Plus, there is always the Antique/Wine/Fruit Stand outside of Yakima. We saw that on a trip we took last Memorial Day weekend, and we were intrigued, but when we were there it was evening, and they were closed. I firmly believe that everyone should take the opportunity to see these kitschy touristy locales when they get the chance. If for no other reason than to be able to say, “Hey, you know that Antique/Wine/Fruit Stand off of I-82?” “Yes, why as a matter of fact, I’ve been there!” And so we’ll go! So, I’ve been a little bit scarce lately because I started a new job a few weeks ago. I am enjoying it a lot more than my previous job, and have more responsibility and authority and not to be minimized – fun. But that means that I haven’t had much time to write and unfortunately, it also means that I don’t have any time off accrued here. Now that is a bummer, and hard to stomach. One of the nice things about the old job was my large PTO bank. And since I rarely get sick, I was able to use it all for vacations. I got used to being able to be away when I wanted to be away, within the confines of my payroll schedule. Now, eventually I’ll have a lot more flexibility to be away because I no longer have to run the payroll on a schedule, but for now I have no time built up. I know that there are lots of people out there who neither have the time off nor the money to take a vacation and you may be reading this and seething about my expectation for lots of time off, but I went and got my Master’s degree to afford myself a bit of luxury. To put it succinctly, this is trying my sanity. My last official vacation (not counting some weekend trips to see family), was in August 2010. That is almost 6 months! Add that to the fact that it is dark, cold and rainy here at home, and I am in need of some serious therapy. Jon and I decided that since we cannot yet remedy the vacation situation, we would take a long weekend to the Yakima Valley. We are going to splurge on a nicer hotel than we usually get, which I am looking forward to. Neither of us has been to the Yakima area for wine tasting, but we have tried several of the wines that are produced there and have been quite pleased with what we have had. We are currently in the process of deciding what will be on our list of places to visit, since we know we won’t have time to go everyplace we want to. Some of the items on our list of requirements are: wineries that have a mix of whites and reds, affordability, and wines that are not easily obtained at home. The general rule is that if I can buy a lot of your wines in the grocery store at home, then I’m not very interested in making a special trip out to see you. Others may disagree, arguing that a winery may have premium wines that aren’t available anywhere but the winery. That is a valid point, but with hundreds of Washington wineries on the list, we have to have some criteria to narrow it down. Perhaps when we have a lot more wineries under our belt, we will relax on that particular rule. Of course, by then, there will be hundreds of new wineries to visit. And on a different wine topic, last night Jon and I cracked open a bottle of a local red wine called Harbor Light. It is produced by a winery in Blaine, Washington called Glacial Lake Missoula. GLM is extremely small production, and they pretty much only sell from the winery, but don’t let that fool you. The wines are amazing. I have said before that I tend to steer clear of Cabernets because so many of them are very oakey and overpowering. GLM’s wines are all Cabernet Sauvignon based (that will be changing in 2011 with the release of a Marsanne with a twist – they are adding the leftover red skins to make a red wine with a white varietal), but they have a talent in making the wines appeal to all. The Deluge, which is 75% Cabernet Sauvignon and 25% Cabernet Franc, is dry and delicious, and the perfect accompaniment to a steak or pasta with red sauce. Perhaps we will have to head up there this weekend for the mini-est of getaways.